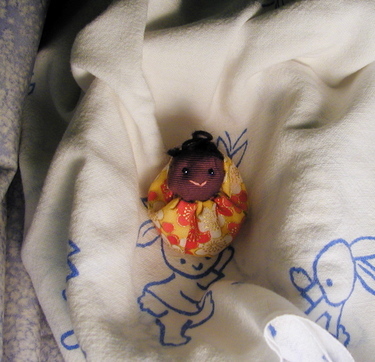 Here's a tiny doll made to go in our goodwill goody bags to AfricanKelli for her to take to Mozambique next month. I wanted to make something small (has to be, the goody bags are tiny) and fairly simple (for my sanity), so I got out my Japanese craft book collection and decided upon this one. 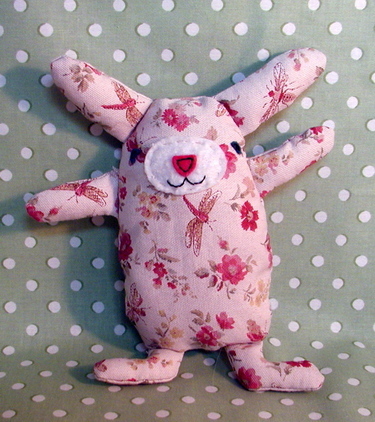 Isn't it amazing what you can do with tiny bits of fabric? This is just a 2.5 inch circle plus a 5.5 x 2.75 inch rectangle. 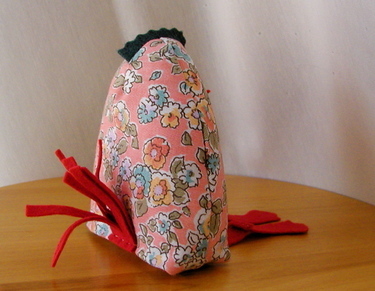 The finished doll is only about 2 inches across. 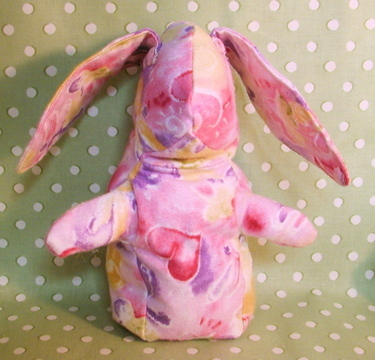 The idea and pattern were from the "Bunnies" book in this table, 2nd row. I love just about every project in this book, I don't know why I haven't made more from it. The bunny towel underneath is from Japan, from my own baby-hood. I believe they used to be diapers, but if so, the ink certainly has held up well. My mom saved a bunch and gave them to me to use as burp cloths for Max. I love them! 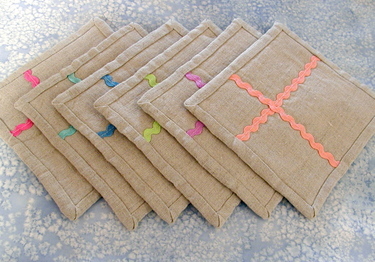 Just a few more bebês pequenos to make and then I can send them down to Kelli for their journey far far away. I really hope the kids like them as much as I enjoyed making them. 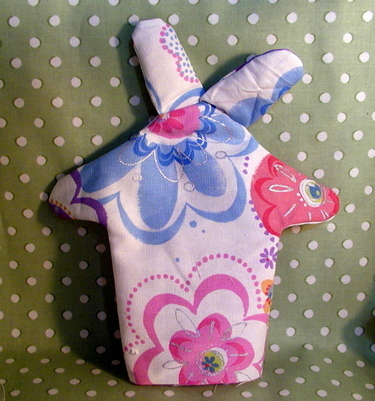 This is one of the great things about handcrafts, one of the things I love and the reason I do it. Handcrafts take longer to create than just popping off to Target to buy something, so I spend more time thinking about the intended recipient while sewing. It's the same concept as is behind prayer shawls, knitting a prayer for someone into a shawl. 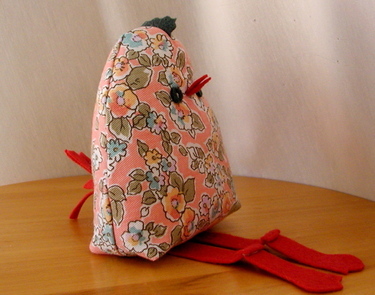 But it doesn't stop there, it also works with other handcrafts. With these bebês, each little handmade stitch brings with it a hope for a better life, a good life. Here's part of the invitation for our upcoming Children's Day party. Koi nobori (carp streamer/kite), happily flying in the breeze. Max helped to make these by sponge-painting the blue/white background, and helping with the block printing. I love koi nobori, what's not to love about kites? I'm planning one, maybe two koi-themed crafts for the party. Off to work on those next. 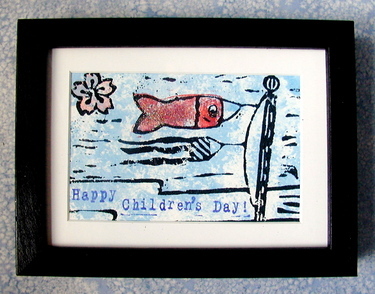 If you'd like to send a happy koi card to someone for Children's day, a few extra are here. Update: I had to add a footnote to this post, after reading Alison's post about her son Max who loves to paint himself. As my Max would say, "the entire self of him". Mine is completely against things touching him, be they paint, glue, dough, etc. For many art projects, he spends much of the time picking dried glue off his fingers. Apparently paint involved in sponge painting is different. It's ok if this kind of paint touches his fingers. Max helped with the sponge painting of the light blue backgrounds of these cards. The paint gets all into the sponge and then seeps out and touches your fingers. His response: "that's ok if it gets on my fingers." Good. And we had fun. And I think he's a wonderful sponge painter! I fantasize about politely stopping someone on the road and asking them what's going on in their life that they felt compelled to do that incredibly bone-headed thing that they just did. I'm talking traffic-wise, like cutting me off, or tailgating me for a mile, or something similar. I'm serious about this. I don't want to yell at them, I just want to know why they're not thinking so well so as to drive to endanger, or perhaps why they feel more entitled to the road than I am. Today on my way home, someone popped into a barely car-sized space between me and the car in front of me. In the middle of an intersection no less. (I know, it happens all the time, no big deal. But bear with me for the sake of the story.) I gently beeped at him, one of those barely-there beeps to let him know that I had been planning to occupy that space in the next nanosecond and that perhaps that move wasn't the safest as I almost hit him. At the next light, I needed to get into the left-hand lane beside him, so common sense got the better of me and I rolled down my window to ask him if he knew that he wasn't supposed to change lanes in the middle of an intersection. His response was something along the lines of "don't beep", but with much gesturing and some slightly more colorful language. And then the person behind me beeped long and hard, because the light had just changed and we hadn't moved yet, not that we could have. Perhaps she wanted to know what I was thinking too. What I'm thinking now is that perhaps I don't really want to know what's going on in the lives and minds of people I "meet" on the road. I'm working on a new fantasy, one where I wave and smile pleasantly, and everyone goes about their day happily. The next version. A disaster. 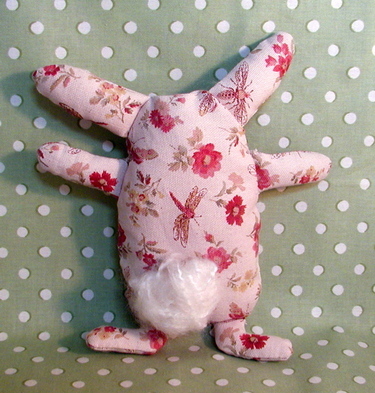 The resemblance to a rabbit is diminishing. Granted, you can now put fingers in the arms. This version was abandoned. And the final version. More bunny-like, fingers can work the arms. I still need to add facial features, but this is much better than the beginning attempt. ...aka a rocketship. 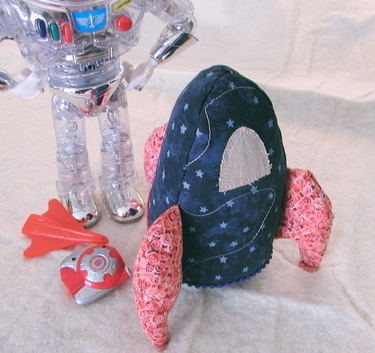 Following in the rocket theme we have here at Zhinka dinka doo. Another in my line of quickie softies. Does two of something make a "line"? You can see Buzz Lightyear in the background there trying to figure out how he's going to fit in this smallish rocket. This little fellow was conceived of sometime during the night. This morning after my walk and breakfast, I quickly set about to making him, purposefully skipping the steps of planning, worry, planning, drafting that usually accompany my projects. I just wanted to make something quickly and I didn't care too much how it turned out. And the funny thing? I think he turned out just fine. It's funny (or not), the overthinking that goes into things. I do this at work too. I think I'm still recovering from my last really big project at work, and that was 2 years ago. 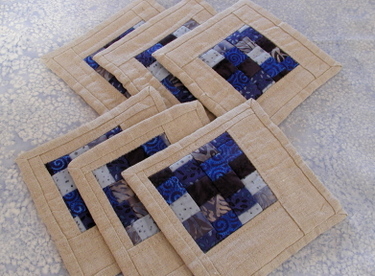 Quick projects both at work and in crafting, don't have quite the same feeling of immense accomplishment that comes with having finished something really difficult. But then again, quick projects are more likely to be finished, period. I have a string of projects that were abandoned at various stages because they were too difficult, or not working out, or whatever. So here's to the quick project! Tail feathers up! It turns out that these are the perfect "waiting" project. I pack them all into a plastic tub that used to have organic baby spinach in it, toss in scissors, thread, a needle and a few pins, and I'm ready to handsew for a few minutes or an hour. Perfect. Did you happen to notice that I have new pictures? I didn't have to resort to getting a new camera. I just unscrewed every screw on my camera except the ones on the lens, and popped it all back into place. Then it seemed to work again!!! I was pretty surprised that this worked. I was resigned to getting a new camera, but not that happy about it. I like this one. I know, it has only 2 megapixels, which is probably less than they put in toy cameras they give away with happy meals (if only!). But I know this one, and I like it. So I can put off getting a new camera for another year or two. Good.